Nablus City, in Palestine, was of the 20 cities and one of the four cities in the Arab Region. 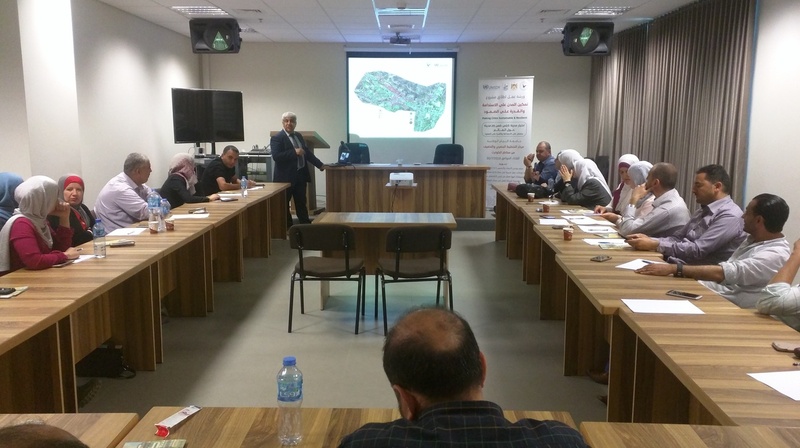 The Urban Planning and Disaster Risk Reduction Center UPDRRC of An Najah National University which was contracted and supported by UNISDR to conduct the project, was the first among all 20 cites to conduct 2 day training workshops on DRR and the score card in Nablus. The training workshops took place on the 1st and 2nd August, 2018. The trainees were all representatives of the different institutions of the city that are involved and concerned in Disaster Risk Reduction and activities towards resilient Nablus. - Present the different international terminologies to all participants. - Familiarize the participants with these different terms to reach a common understanding on these terms about Disaster Risk Reduction, Resilience and others. - Emphasize on the need for cooperation and coordination between all concerned stakeholders. - Brainstorming among all participants to raise any issue that may be of concern to the city in general and possible action. Share ideas and thoughts. - Familiarize participants with a ten Essentials of Sendia framework 2015-2030 in connection with the City of Nablus. - Present the Score Card and familiarize the participants on what is needed to answer the questions and select the proper answers that really represent the correct situation in the city. - Familiarize participants on the methodologies used to implement the Score Card applying correct and agreed logical evaluations that represent the real status of the city. - Innovate the participants to start working and preparing for filling the results of the Score Card as a preparation to the upcoming work on the disaster resilience Score Card- detailed level assessment. The workshop in both days was attended by representative of concerned different governmental and nongovernmental organizations with special attendance from Nablus Municipality different departments. - Palestinian ministries of: Education, local government, public works and housing, interior affairs, information, civil defense, environmental quality authority and economy. - Representatives from Nablus Municipality, An-Najah University. - Red CrescentSociety, Nablus Chamber of Commerce and Industry. - Northern Electricity Distribution Company. In order to familiarize and build the capacity of the participants to improve their knowledge on the project and the subjects connected to Disaster Risk Reduction as a general concept with all subjects incorporated, there was a need to allocate time to achieve that through this two-day training workshop. - Introduction about the UNISDR initiative, the idea behind the selection of Nablus and briefing about the cities selected. - The need for shifting to sustainable development and the connection between the sustainable development and ability to deal with disaster and be well prepared. - Hugo framework 2005-2015 with its 5 priorities and shifting to Sendia Frame work 2015-2030 with the difference between the two. · The need to consider disaster reduction as a national priority. · Work on different scenarios through preparation of mapping for disaster, capacity building and training on disaster response. · Work on the community level in line with the national level. - Sendia framework for Disaster Reduction 2015-2030 with its ten Essentials and for priorities. - General introduction about Risk assessment and risk management and their main concepts. - European Macro-seismic scale EMS98 with its classification of damage grades. - Post Disaster Damage Assessment (Rapid Assessment) including the concepts of the Flash, initial and final reports. Presentation of examples and cases for damage levels sharing with participants. - Open discussions, questions and answers. - Presentation of the different terminologies used in the disaster risk reduction, management, assessment, mitigation, preparedness and others. - Sendia Framework for DRR with ten Essentials. - Score Card, detailed level, with some examples covering the Essentials to explain how the Score Card should be filled. - Open discussion through presentation of ideas, thoughts of the situation of Nablus City connecting with Score Card. - All required materials and terminologies were distributed to all participants. - They were urged to start working on collecting the needed information from reliable sources to be led by the municipality in order to start working on the score card during the planned Score Card sessions in early September -2018. - The participatory approach will be adopted in order to achieve the correct scores towards identification of where Nablus Stands.